If you are continuously getting annoying calls, You might have to realize that acquiring a new number could be your last choice to end this phone harassment! It may cost some money or it may be difficult to share your new number with all your contacts, but it’s a fast and guaranteed solution. If the relentless tide of nuisance calls proves too much to bear you are recommended to consider the purchase of a new phone number. This way you can actually lower the costs of your phone bill since providers tend to offer even better condition on their contracts after every year or two. It would be wise to take your time and have a closer look at providers and their offers available to you. Once your number was sucked into the insatiable vortex of a callcenter’s data base the possibility of you being left alone is quasi non existent. Carry your old number to the grave and embrace a new one even if this requires more efforts in the restoration of your own address book. Handle your new number with care! Only give it to people your know! Avoid at cost the distribution of your number for the sake to “serious” lotteries and similar phone number phishing endeavors. You should also consider not to divulge your number on world wide web. It is known that people who undertook quotes to find a new insurance and gave their number in the online form were quickly and regularly called by insurance brokers. Stick to your friends and family. Of course, you also can employ two phones numbers, one for spam and one for serious business. Get your tellows app today! If you just got a new number and you are looking for a high quality protection for your phone, we have a solution for you! With tellows Caller ID & Block App on your phone, you can protect yourself from unwanted and dubious calls. The app can identify unknown phone numbers for you. You can even know who’s calling you when your phone rings. 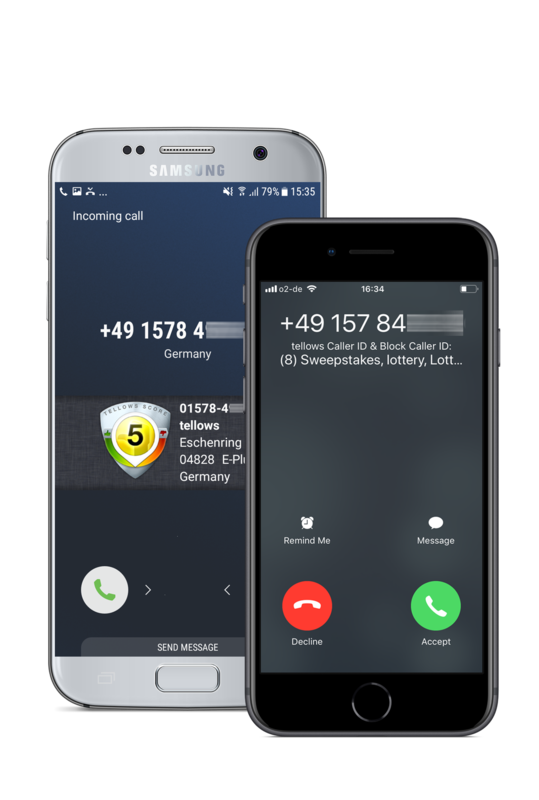 When your receive a call from an unknown number, the app can automatically display the information about the caller reported by users. With the displayed tellows score, you can know how dangerous the call might be. tellows app also has a blocking feature (premium version) that can protect your from spam calls. Therefore, you will not be annoyed by dubious calls everyday. To download the app, just click on the button of the app.